A highly capable player which achieves much by doing little. At a first listening, its sound may not seem immediately outstanding, but on longer familiarity its confidence is most impressive. 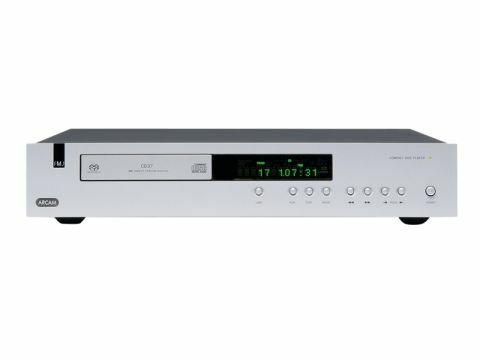 Although one or two of Arcam's more AV-oriented disc players have, over the years, supported SACD, the CD37 is the first of its stereo-only CD players to include SACD replay. There's no denying that SACD is a bit of a minority interest, but it's likely that its inclusion didn't cost Arcam very much – nor, by implication, will it cost the purchaser. The big far-Eastern manufacturers of subassemblies and components are tending to build SACD into the standard parts and, as a result, one might find that having designed a CD player, one has accidentally produced an SACD player, too. But even if you never play a single SACD, there's a certain comfort that comes from knowing the audio circuits are designed to support the higher resolution of that format. In other words, they should be more than a match for the requirements of CD. And looking at the inside of the CD37, we get the distinct impression that Arcam is leaving little to chance in terms of recovering precious details of audio signals. The circuit board – quite large for a current CD player – contains plenty of recent, good quality parts, as one would expect. The power supply uses two separate toroidal transformers and everything is immaculately laid out. There is also quite extensive use of damping, both mechanical and electromagnetic. The former includes bits of rubber glued to key components, while the latter takes the form of ferrite discs attached to critical integrated circuits. The idea is to prevent radiation of electromagnetic noise within the case. More mechanical damping is applied to the lightweight aluminium lid, which is unusually non-resonant. The player is particularly pleasant to use thanks to its clear display and intelligent control layout. We hesitate to say it, but this player shows some evidence of what we've come to think of as the Arcam 'house sound': clear, detailed, a little understated and hence, to some ears, not quite as involving as some. Or, at least, not quite as immediately gripping as some. For obvious reasons our 'blind' listening sessions are very short compared with a relaxed evening's listening to a new piece of kit, but even under these test conditions our listeners warmed to the CD37's sound. Starting with a famous bit of Miles Davis, this player brought forth comments that were positive, but perhaps a little lukewarm – 'good' rather than 'very good' and so on. But even the specific areas of sonic performance that were greeted in such terms had started to attract much stronger praise by the time the final, orchestral, track was reached and, in general, it seems our listeners were connecting with the music much more readily, where before they had been a little reserved. Terms like 'absorbing performance' took the place of technical comments on bass and treble and the sound was clearly thought to be more involving. Throughout the presentation, two areas were consistently praised: detail and bass control. The latter can sometimes be at odds with extension and tunefulness, but that doesn't seem to be the case here. There were favourable comments on both those areas and also on the power with which orchestral percussion was portrayed. As a result, this player makes convincing work of large-scale music and is particularly assured in distinguishing between the tone and location of instruments within the ensemble. Voices, too, are well differentiated from each other and from their backing. If anything, the character is even more marked with SACD replay, which similarly shows up its full quality only after listening for a while. The CD37 may not immediately impress from a five-minute dealer demo, but half and hour or more in its company can be extremely satisfying indeed.